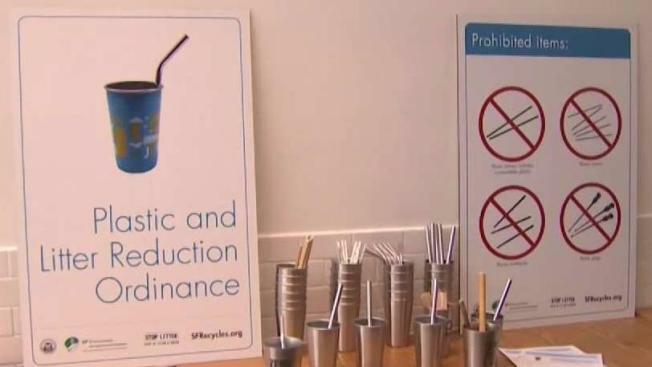 New legislation being introduced at Tuesday's San Francisco Board of Supervisors meeting could change the way San Franciscans eat out by banning small plastic items like straws and other foodware. Mark Matthews reports. New legislation being introduced at Tuesday's San Francisco Board of Supervisors meeting could change the way San Franciscans eat out by banning small plastic items like straws and other foodware. Supervisor Katy Tang announced the proposed ordinance this morning inside Boba Guys at 1522 Fillmore St., along with other supervisors and city officials. The ordinance would prohibit the use of single-use plastic foodware items such as straws, lids, stirrers, utensils, condiment packages, sleeves and beverage plugs. According to Tang, in San Francisco alone, about a million straws are used each day. Furthermore, small plastic foodware makes up about 67 percent of street litter that goes into the Bay. "I've always been very inspired to use my legislative powers to be able to do good things for the environment and I saw this opportunity and saw how much waste we generate from plastics," Tang said. "Straws literally fall through the cracks of machines. So even if you think you're recycling them, you're actually not. They end up in our landfills and sometimes in our sewer systems and a lot of times into our oceans and get absorbed into our wildlife," she said. Boba Guys, the popular San Francisco-based milk tea beverage business that normally sees lines out-the-door, is one of the local businesses helping spearhead the movement to eliminate small plastics. "We see this as a huge opportunity, not just for Boba Guys, but for the entire industry — a billion dollar industry worldwide," Boba Guys co-founder Bin Chen said. According to Chen, when Boba Guys first started around 2002, Chen and his partner began looking into using compostable straws and cups, but said they hit too many roadblocks within the industry. About 16 years later, after the business has expanded with locations now in New York City and Los Angeles, Boba Guys is set to begin building a factory in Hayward where it will be able to create its own reusable cups, straws and biodegradable foodware. "We finally have the type of clout to call for this change," Chen said. "This is the city to lead and we're really proud to be a part of that." "Here in San Francisco, we don't just talk about being environmental leaders, we set the trend for the country to follow and this is no different," Board of Supervisors president London Breed said. "I'm excited about this opportunity because we need to look at how we use different products and how, when there are alternatives, we can make changes." If approved, the ordinance would add to a list of innovative measures taken in the city to reduce plastic waste, with a citywide ban on non-biodegradable plastic bags happening in 2007 and a ban on Styrofoam going into effect last year. Bay Area cities that have recently approved a ban or limit on plastic straws include Alameda, Oakland and Berkeley. Additionally, Santa Cruz, Davis, San Luis Obispo, Malibu, Seattle, Miami Beach and Fort Meyers, Florida, have also taken similar measures. If approved, the ordinance would go into effect on July 1, 2019. "We need a change of culture in San Francisco," Tang said. "It's a really huge worldwide issue and I think there is a lot of momentum right now."